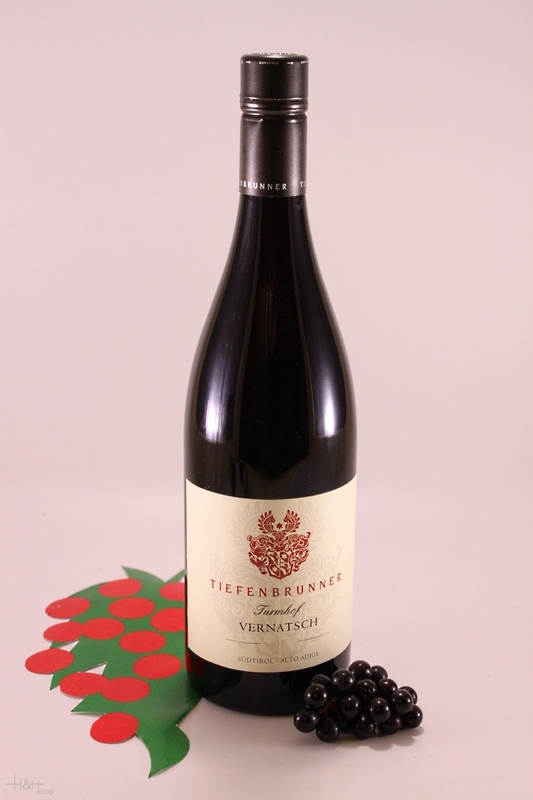 Description: This wine once again proves the great potential of the Vernatsch variety. Bright ruby-red in color, it shows fine fruit aromas as well as vinous flavors of marzipan and light bitter almond. With light tannins and pleasant freshness, this well-balanced wine is uncomplicated and easy-drinking. Serving suggestion: Pairs well with all sorts of meat and fish, but makes an especially good accompaniment to sausage or South Tyrolean speck, as well as braised or grilled white meats. Vinification: fermented using a special extraction process, followed by malolactic fermentation in stainless steel tanks; aging for 4 months in oak barrels. "Doctorwine" has rated the wine "Tiefenbrunner Turmhoff Grauvernatsch-Schiava Grigia, Trentino-Alto-Adige, Italy" from the vintage 2012 on 25.06.2013 with 90 of 100 points.
" Turmhof is the name of a 12th century castle which for generations was inhabited by the Tiefenbrunner family, whose name was given to the winery. This wine has delicate fruity scents with a fine spicy streak. The flavor is delicate, mineral and goes down wonderfully. "